My last post ended with the creation of by daughters' first tabletop characters. To review, my youngest built a noble teifling paladin named Makaria who longs for adventure, renown and strawberries. The oldest made Yevelda, a half-orc fighter who is a former scout and soldier that demands loyalty and honor from her friends. Finally, my wife created Luella, a gnomish rogue and purser aboard a ship whose captain cheated her out of her fair share. With these three characters, I began building their adventure. I set their story in a coastal trading town, ruled by Makaria's Merchant Lord father. Yevelda, fresh out of her service in the army and looking for work took a job as a bodyguard for the young paladin. Makaria is desperate for adventure and excitement and drags Yevelda all over town to find something worthy of her blade. After a few crappy jobs sweeping basements or setting rat traps, the pair decide to go into business proper and put out notices for a position in the company. Luella finds one at the docks not long after getting into port. After the first meeting it was clear that Luella was the perfect leader for the two fledgling adventurers. And so the Goodfellowes set forth. With new players I think it important to give them a taste for the different mechanics in a safe way. By letting them get a feel for the game bit by bit rather than all at once, you seriously reduce the chances of an early burnout campaign. I wanted to streamline the process a little more for my girls because of their age and set each area up like a building block that would add on to the mechanics they tried in the previous scene. Their journey eventually took them outside the village's wall looking for a missing wagon. Before leaving the town, they went from shop to shop, asking each merchant and tradesman about the wagon, it's route and supplies. The kiddos had a great time talking and bartering for information with the shopkeepers. When they had the supplies and info they needed, it was time to head out. The party found some signs of the wagon on the road, in a mound of upturned earth. With her experience as a scout, Yevelda was able to identify the mound (and others like it) as a sign of a Bulette. The Bulette is essentially a land shark/armadillo/possum with a ravenous appetite for anything that moves. 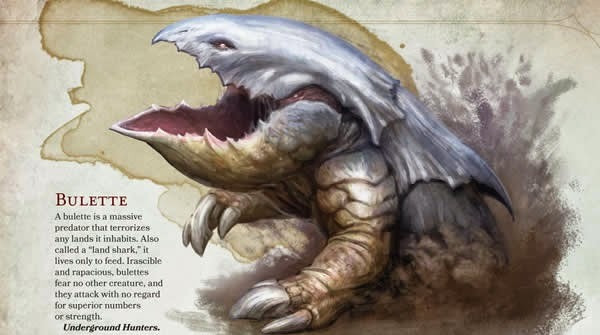 Once the party cleared the are to make sure the Bulette had moved further down the road, they made camp and discussed options for catching and killing the monster. After enduring so many plans, Luella finally decided to trap the beast with bait from a freshly killed animal. 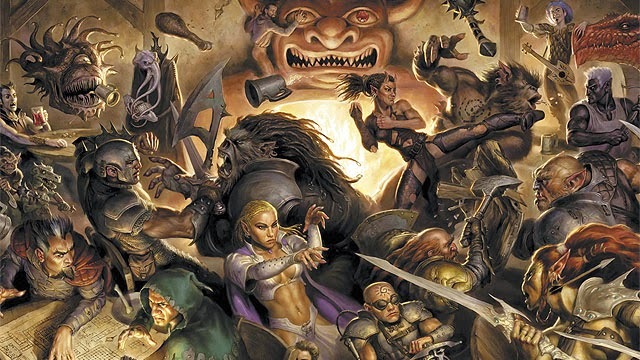 The next morning (in the game) brought the party's first combat encounter. The elk they tracked proved very little resistance and the girls killed it in record time. Of course, this was due in no small part to the natural 20 rolled by my oldest on her first combat check. The luck was with her that night; I don't recall her rolling anything less than a 12. When it came time to actually fight the Bulette, the girls had a good grasp of their characters' roles in the game and how to get the most from their turn. The youngest delivered the killing blow, a fact that she has reminded me of daily from then on. They returned to the village, missing supplies recovered and enough XP to make second level. The girls loved the game. Our oldest thought carefully about her character's choices and actions, making sure that they reflected well on her story and established backstory. She was a picture perfect stoic half-orc. Our littlest player handled every situation in the game with awe and wonder. The slightest clue to the fate of the missing wagon was met with an audible gasp and the immediate suggestion of draconic involvement.She also insisted on acting out whatever she could. Setting up her tent for camp, starting a fire, going to bed, riding a horse all came to life in silent pantomime. It was precious. Since the conclusion of our little adventure, the girls have been begging me to run another game for them. It took a bit of time to explain to them that in order to run another game I'd need some time to put everything in order. They were a bit pouty then, but they see now that daddy can't run the game without so much as a plan. Seeing them this excited about a tabletop game is such a treat. I'll be happy to run them through their games for as long as they will play.